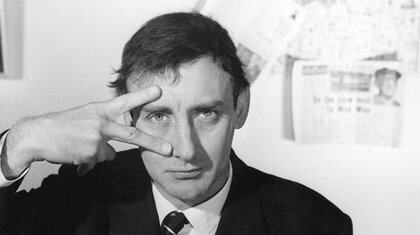 Terence Alan Milligan (16 April 1918 – 27 February 2002), known as Spike Milligan, was a British-Irish comedian, writer, poet, playwright and actor. The son of an Irish father and an English mother, Milligan was born in India where he spent his childhood, before returning to live and work the majority of his life in the United Kingdom. Disliking his first name, he began to call himself "Spike" after hearing the band Spike Jones and his City Slickers on Radio Luxembourg.Milligan was the co-creator, main writer and a principal cast member of the British radio programme The Goon Show, performing a range of roles including the Eccles and Minnie Bannister characters. He was the earliest-born, longest-lived and last surviving member of the Goons. Milligan parlayed success with the Goon Show into television with Q5, a surreal sketch show credited as a major influence on the members of Monty Python's Flying Circus.